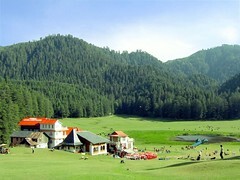 There are lots of tourist places in Himachal and visiting all can't be possible in one go. You can plan out different trips to various places at your convenience. The Kullu valley is also known as the valley of the Gods where beside seeking blessings of Goddess Hidimba at Manali and a dip in hot water of Vashistha you can enjoy trekking, rafting, gliding and skiing. Don't forget to visit Solang valley, Roerich art gallary and the Naggar Castle, a stone and wood structure built by Raja Sidh singh over 500 years ago. Kangra valley has lots of sacred places like Jawalamukhi, Brajeshwari Devi temple, Chamunda Devi, Rock cut temple Masroor, places of historical importance like Sujanpur fort, Kangra fort, Judges Court in Heritage village Paragpur. You can have a glimpse of western culture at Mcleodganj(Dharamshala). Dharamshala cricket stadium , Bhagsunath, lush green tea gardens of Palampur and Sobha Singh art gallery at Andretta are other famous tourist spots of Kangra. Chamba Chaugan, Khajiyaar the mini Switzerland of India and Shiva temples in Bharmaur, Manimahesh are special attractions of Chamba district. State capital Shimla has been hot spot for tourists since British rule. Round the year tourists from India and abroad visit Shimla, Jakhu temple, Kufri, Naldera and Mashobra.